I have old "GoFlex Home" Device. I am Noob and want to install the latest Debian. Which instruction is the most relevant for installing latest Debian on my device GoFlex Home ? Edited 1 time(s). Last edit at 10/27/2018 03:21AM by valery. Read these 2 posts and see if you're comfortable with running those installation procedures. ethaddr this is MAC of my box, but where can i find the correct value of the mtdparts? Also I did not quite understand - In which case the box boot from SATA, and in which with the NAND? > where can i find the correct value of the mtdparts? Usually you would see it from stock OS when logged in. But for this GoFlexHome, you don't need to set it, because the default in the env image is already correct for this box. It will not boot from NAND any more after you install new u-boot. You will boot from either the USB or SATA with the new rootfs Debian-4..12.1-kirkwood-tld-1-rootfs-bodhi.tar.bz2 on it. This is optional. This is good to have, but in a normal case it is likely not needed. BTW, do you have serial console connected? It would be great to have it in case you need to trouble shoot booting problem. Is it ok to continue with your instructions after this error? 3) Copied fw_env.config file to Stock OS /etc folder. I am new to Linux and learning at a slow pace. That error is OK when you run fw_printenv in stock OS. Go ahead with the u-boot installation. After you've flashed new u-boot, that error should not occur. Should I prepare a new usb flash drive and plug it in the GoFlex home before I proceed further? This was a difficult installation for me, but I was able to do it, again thanks for your help. The authenticity of host '192.168.x.x (192.168.x.x)' can't be established. ECDSA key fingerprint is SHA256:X3OIp2RLSH4. Warning: Permanently added '192.168.x.x' (ECDSA) to the list of known hosts. I have GoFlex Home, after resetting have no possibility to register and connect to device. I have firmware file to install from usb-pen, with initrd, uImage and hipserv2_seagateplug-20160314.ubi . Can I make .ubi file with debian to install it using usb pen without ssh access to my device? 1) Were you running stock OS when you reset your device? 2) How was the device reset? Did you try to install other firmware or did you do manual reset on the stock OS? 2.I reseted it by press side button and install last stock firmware from usb-pen. You can do both inside stock OS. bodhi, I can`t connect to device by ssh, becouse I cannot create user without registration. So i can only change firmware by loading ubi file from usb-pen. 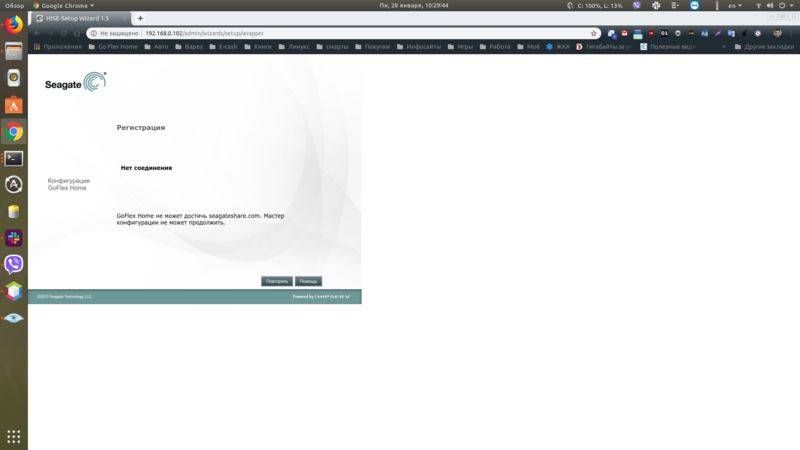 I read instruction, but don`t understand - do i have to do all steps on PC with linux(now i am in ubuntu 18.04) and prepeared usb-pen will be bootable for goflex home? according the instruction pen must be formatted to ext3, but stock firmware installing from fat32 only. Will GoFlexHome load debian from ext3 usb-pen with stock uboot? I think there may be a larger issue involved here. In coming days you will see many more users stuck with a box they cannot access after they have factory reset it. Seagate turned their server off on Dec 31, 2018. Any one who resets their device after this date will be unable to create a user name and password to access the Goflex Home. Unless someone figures out a hidden root user name and password. Though there may be a way to hack it using serial cable and installing Debian on it, but I am sure a username and password will still be needed when connecting through the physical serial cable. (I was also thinking of restoring it back to factory because I am having difficult time installing Samba and OpenMediaVault on my box, both give some strange fork error). But Now I will wait until a solution is found for Skia's issue, until then my box will be hibernating or I will figure out how to install Samba and OpenMediaVault on it. So everyone running debian on these boxes is now stuck and should not try to revert to factory OS, unless they have a backup somewhere that includes username and passwords from before flashing Debian. This article is for informational purposes only and no longer being updated by Seagate. What to know about GoFlex Home and the Discontinuation of Remote Access. GoFlex Home Remote Access will be shut off December 31st, 2018. All other GoFlex Home features should continue to work on your local network. The data on the device should not be deleted or altered in any way. Only the remote access feature will be discontinued. Once the service has been shut down there are a few important things you need to know. Under Server Preferences, UPnP Router Configuration, select No for Configure Router via UPnP. Note: If you manually set up port forwarding in the router’s setup page, those entries should be deleted. Please refer to your router’s documentation for instructions. It may be necessary to go into your router’s setup page and disable UPNP then re-enable UPnP. This would clear any unused port forwarding in the UPnP list. Please see your router's documentation for instructions. Open a Browser and type the following in the URL field. To connect via Finder or File Explorer see the article below. Do not use the Factory Reset Button on the side of the device’s base to reset the device. Note: After resetting the GoFlex Home the Setup Wizard will attempt to re-activate the GoFlex Home and would prompt for a new GoFlex Home Name and Password. Since the Remote Access Service is no longer available, the device would be unable to authenticate the new Name and Password. Therefore Setup would not be able to complete. Do not attempt to upgrade or downgrade the GoFlex Home firmware. When Seagate service is EOL like this, we should not try to keep stock OS. As a matter of fact, this forum mission is to help users install and run the latest Linux kernel on Debian (we don't care about stock). For most of the Kirkwood boxes, such as the GF Home, when you cannot log in to stock using SSH, the path to install new system is to connect serial console. And then use kwboot to load and run the new u-boot, and run new u-boot and Debian. 1. Create a new rootfs using the tarball Debian-4.12.1-kirkwood-tld-1-rootfs-bodhi.tar.bz2 from the release thread. 2. Download the latest u-boot tarball uboot.2017.07-tld-1.goflexhome.bodhi.tar from the u-boot release thread..
3. Download latest kwboot binary from this post. This is an ARM version. If you are running another ARM or x86 Ubuntu-like box to connect serial console, you can also use kwboot version on that system by installing u-boot-tools. It is not possible to run kwboot on Windows system. 5. Adjust the u-boot env dtb_file to the GoFlex Home version. And boot. 6. After you can boot into the new Debian rootfs, you can install new u-boot from there to make it permanent. I'll create a new post for the detailed instruction to run kwboot on GF Home, to help make it easier. Note: The RX and TX are interchanged at one end, this is because the RX of the GoFlex becomes the TX of the USB adapter, and vice cersa. The serial console is especially useful for debugging the kernel boot and setting the u-boot environment. > TX of the USB adapter, and vice cersa. That's not entirely accurate. The GoFlex Home serial port, like all other serial ports, have defined pinouts that are true. It depends on what type of serial converter being used, that the TX and RX might need to be crossed. The CP2xxx type converter do not cross (eg. its RX should be connected to the box RX). The Prolific PL3xxx type converter must be crossed (eg. its RX should be connected to the box TX). If that gives errors your USB stick may be faulty, create a new rootfs and try again. OMV is too resource intensive for the Goflex, I believe older versions worked on Debian8 though. Again there’s details in the Wiki thread. Thanks, got Samba working. Now on to OMV. However I am getting comfortable using the command line to configure Debian so may not need OMV after all. Congrats! The Goflex is a great little box once you getting running. I've used only the command line to set up mine and it is chugging along nicely with Samba, NFS and AFP. If you decide to setup OMV search the forum, there's a few posts on getting it working on kirkwoods. The lack of RAM will be an issue though. Edited 1 time(s). Last edit at 01/31/2019 06:07PM by jdwl101. 1) (i) what is the recommended partition layout for the New 250 GB WD2500AAJS? Should I (a) create single ext3 Partition? or (b) Two Partitions with one being ext3 and other Swap? or (c) Three Partitions one ext3 for rootfs, other Swap and third ext4 for data? and (ii) what should be the ideal size for these partitions? 2) I should install a rescue system before I do this, what is the recommended rescue system to install on this Box? I am running Debian-4.12.1-kirkwood-tld-1-rootfs-bodhi.tar.bz2 with uboot.2017.07-tld-1.goflexhome.bodhi.tar. > ideal size for these partitions? With the new u-boot uboot.2017.07-tld-1 for goflexhome, you can use EXT3 or EXT4, it will work fine with either. - I would use a swap file, dont use swap partition. You can create a swap file on any partition type EXT3 or EXT4. The good swap file size for the GoFlex Home is 512MB or greater. - The simplest configuration is that the HDD has only 1 partition that houses the rootfs. And then use different HDD for data. - Since the GoFlex Home has only 1 SATA port, you might want to use 2 partition: rootfs and data. The rootfs should be about 20 GB to allow for furture growth. > install on this Box? Since I have activated Netconsole, I am skipping rescue system install. I am using cfdisk command to partion the new 250G WD drive. 1) Should the 20G partition that contains rootfs be 83 Linux type? (I have made it Primary and x83 Linux. I will mark it as bootable later after I copy rootfs files to this partition. Also I am assuming that the swap file will be made in this partiton). 3) Should I leave some unallocated space on this drive for future use? 4) Should I be concerned about "Disklable Type: dos" that fdisk -l command shows below? Again, Thanks for your valuable input and time. > drive for future use? No need to. The rootfs in the 1st partition is all you need to care about. 20GB is plenty for rootfs. > dos" that fdisk -l command shows below? Remember to label the rootfs partition rootfs, to ensure correct system booting. Can't seem to figure out how to format the "cp -R Src_directory Dest_directory" command to move rootfs from USB to HD. Should I be using "cp -R /dev/sdb1/boot /dev/sda1/boot" ? The Wiki thread has a couple cloning procedures. It is best to do the copy when both drives are mounted on another Linux box. So asuming the USB drive is /media/sda1, and HDD is /media/sdb1.